Night At The Golden Eagle is slow, boring, pretentious and very unexciting. The cameo by James Caan is just a smile and everybody else looks bored. The razor-thin plot consists of a couple of Italian gangsters who are looking to escape a hotel after a murder. Why they can't escape the hotel is not explained. 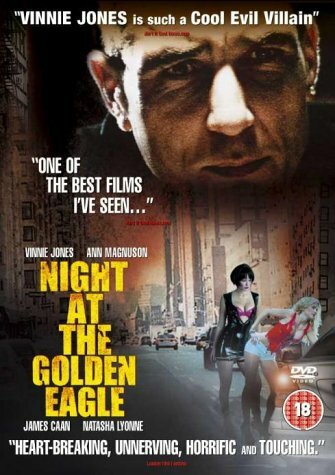 They encounter other characters in the hotel including a pimp played by Vinnie Jones. The very similar Million Dollar Hotel (2000) is better because it has Mel Gibson and Tim Roth. And that movie is really boring and talky as well. The movie has no virtually no action. I don't mind a talky movie once in a while if its good, but Mindwalk (1990) this is not.